Proposal for light design festival which took place in St. Petersburg in September 2016. Declared topic of the festival: Light, space, time. The column hall installation affects each aspect of the topic. exchange their properties: architecture becomes immaterial and the light, on the contrary, becomes tangible. All light sources have dynamic RGB range. 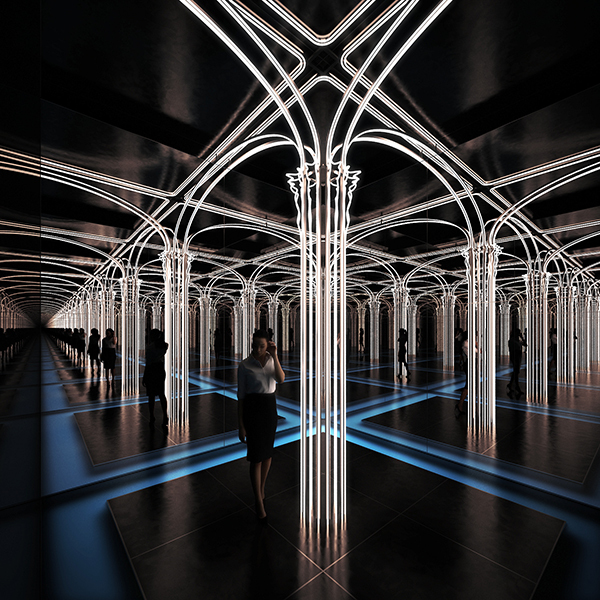 A visitor entering the small room 4x4 meters instantly appears in an endless column hall. Mirrors on the perimeter endlessly multiply the original column. Wow - effect is guaranteed. Time is always manifested in motion, so does proposed installation, which is kinetic. Suddenly, to the astonishment of the visitors, the columns in the room begin to rotate. Regular arcade pattern on the ceiling breaks down and crystallizes in a completely new design. The room turns into a larger version of a kaleidoscope, where people do not just keek with one eye, but are entirely ivolved in the performance.